"Hey, Been Trying to Meet You!" My love affair with the Pixies started in college about 4 years after they formed (at nearby UMass) in 1986. If only I had been aware of those first shows at TT the Bear’s or The Rat! Everyone wants to be a witness to the genesis of a new sound/band/movement! But I didn’t cry over that glass half empty for long. Even as a broke college student, I latched onto as much of their music as I could; buying, borrowing and making mix-tapes. I felt as though their music surrounded me, their sound was everywhere. Black Francis screaming Broken Face (from Surfer Rosa) stayed in my head and followed me through classes. I was listening, my friends were listening, even other bands were listening! Kurt Cobain from Nirvana famously said, “When I heard the Pixies for the first time, I connected with that band so heavily — I should have been in that band …”(1) The “loud quite loud” dynamic used in the Pixies’ songs was used by Nirvana and other bands for years. Learning that the Pixies disbanded in ’93 broke my heart; I thought my love had finally left for good. 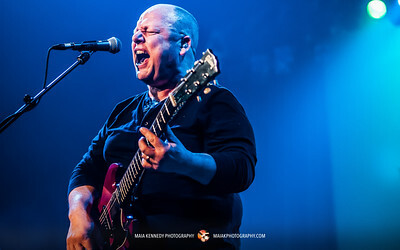 In a desperate attempt to keep this one-sided relationship on-going, I tried to find and listen to all things Pixies; Black Francis with Frank Black and the Catholics and also doing solo stuff as Frank Black, Kim Deal with the Breeders, and Joey Santiago with The Martinis. I had to wait a while, but this fickle relationship would burn again! In 2004, when the band got back together, I of course was back on, hot and heavy! I saw them in Boston on the reunion tour and it felt like college all over again! Now the Pixies are back, same vibe but with a slightly different groove. Their sound has mellowed out a bit. They seem introspective in a more peaceful way, rather than channeling the tension with the screams that came through some of the earlier songs. These 8 new songs, released in two bundles of four, EP-1 and EP-2, are their first new material in over 20 years. Videos for these can be seen at Pixies Official TV on Youtube. On Monday, they opened their North American tour with a last-minute show at the Calvin Theatre in their old stomping grounds of the Pioneer Valley, near UMASS where it all started. Of course, I was hoping the crowd would be small and I’d have the Pixies all to myself. Those wistful hopes were soon dashed as I saw the line for the box office snaking around the block! Getting into the theatre took some time, making my way through the throngs of fans. The audience was a mix of people of all ages, college age and up. I would like to say thank you to all those people standing in front of the stage that let me squeeze in front of them, trying to get close enough to take pictures. The show was incredible! I was not expecting such a long set, but the Pixies definitely delivered! The audience was enthralled, singing along, dancing, and applauding for every song. As soon as Lovering started his assault on the drums to open the song, UMASS, the audience started jumping and the building shook. I won’t spend too much time talking about Kim Deal’s absence, it has already been talked about enough. She was a founding member of the band, a bitchin’ bassist, a great voice, and a key player. She was the balls and will be sorely missed. However, I was really impressed with Paz Lenchantin, their current bass player. She had a great stage presence; sometimes playful and smiling, other times slipping into the shadows, seemingly lost in the tune. I look forward to hearing more of her on future songs. La La Love you came towards the end of the set and took me by surprise. I hadn’t noticed before that Lovering sang lead, but now hearing and seeing him sing it live, it almost seemed to be a new song. I fell in love with the song all over again. Time flew by and it all seemed to end too fast, but the show was thoroughly satisfying. I didn’t feel like anything was missed. They played over 30 songs, peppering the list of old favorites with a few of their newest. The tour will continue now with two shows in Canada, continue up the East Coast and over to the West. It sounds exhausting and I don’t know how they do it, but I hope they realize how much their fans really do appreciate it and will keep following them!